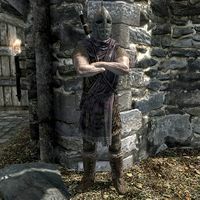 Riften Guards are guards who act as the military and police force of Riften. These guards serve under Jarl Laila Law-Giver. 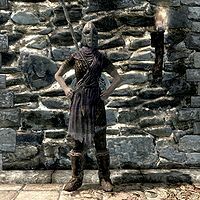 Should the Imperial forces gain control of Riften, they will be replaced by Imperial guards under the service of Jarl Maven Black-Briar. They will protect you from enemy creatures. It can be assumed that some of the guards aren't as law-abiding as they may seem. On your first visit to Riften, one will ask you to pay a "toll" (as he is later revealed to be the "man" of a member of the Thieves Guild) though this payment can be avoided by persuasion or intimidation. Riften guards (aside from the extortion encounter) however, act and carry the same loot as standard guards.